Gatorade inventor Dr. Robert Cade was one of nine honored at halftime of University of Florida's Spring Game on Saturday. Cade is the only non-athlete in the group to be inducted into the University of Florida Athletics Hall of Fame. Cade's impact on the university was written about in an excellent article by Dave Curtis of the Orlando Sentinel. One of my favorite parts about writing "First in Thirst" was the eccentric Cade. He's a brilliant guy who just loves life and -- although he's lost some sharpness with age -- the man is the prototypical scientist entrepreneur. The interesting thing about University of Florida and Cade is that they sure have been honoring him lately. The College of Medicine honored him in 2004. They honored him again at a football game at halftime of a football game in 2005 and at the state legislature that year. This is all interesting because the school and the state hated Cade and the other three inventors for four years while they were embroiled in a lawsuit. Even after the University of Florida got 20 percent of the royalties, Cade was hardly seen as a valuable part of the school. It has only been in, I'd say the last decade or so that the school has appreciated Cade for what he's done. By the way, they should pay attention to the other guys now -- Dr. Jim Free, Dr. Alex De Quesada and Dr. Dana Shires. They are owed some more recognition. Why Oh Why did Gatorade start putting High Frucose Corn Syrup in their product? I relied so much on it's benificial ingredience to sustain me for so many years. I have always been a hugh proponent of Gatorade, but now sadly I must look elsewhere. You have done a disservice to mankind. Anthony, chalk it up to American taste for sweets. Personally I would trade excessive fructose for the potential loss of essential electrolytes found in Gatorade. While the world hydrates itself with bottle after bottle of purified water I prefer to remain healthy with electrolyte replenishment. IMO Gatorade doesn't provide enough information on the importance of electrolytes (beyond sodium) in their marketing materials and scientific research. As far as fructose is concerned, sugar is a double-edged sword. The brain alone is among the most energy consuming organs of the body. Combined with the rest of the nervous system and under athletic physically active conditions it is probably tied for first place with the skeletal and cardiovascular muscles. These all require a lot of energy. And the primary form of energy is glucose. The degree and rapidity by which a carbohydrate affects blood glucose is called glycemic index. Two forms of sugar may provide the same amount of energy (i.e. calories) but affect blood glucose very differently. Consuming actual glucose results in a certain rise in blood glucose concentration. This increase is given a glycemic index measurement of 100, and is considered the benchmark against which all other foods are measured. Foods that exceed 60 cause an enormous spike in insulin, as the body attempts to bring blood sugar down to manageable levels. But the spike in insulin causes a near complete depletion of blood sugar. This is undesirable for athletes, since the brain and muscles depend on a steady supply of glucose for optimal performance. Please note that fructose is the best conduit for creating glucose in the body. It happened in Nov. 2006, but it wasn't a decision made by Gatorade. Pepsico started using it. They have promised to take it out and go back to the original glucose-sucrose solution. (as I sit and drink my gatorade now) I just got onto this blog and I haven't stopped reading for an hour. Nice work! I'd agree, the other guys need some recognition here. Wow, its a long time any ways congrats. Congratulations is a great notice and I hope to know more about Dr. Robert and his achievements is a interesting person. Congratulations is a great new and post I like this kind of people that put all its effort in the things that they do. Robert Cade is an incredible person he a worthy member of the hall. Why you don't continue with your blog ? Try "Title Sports Drink",the newest product on the market in Florida at this time. All natural. 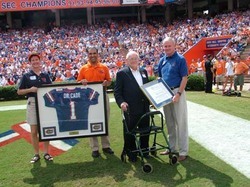 great post about Dr. Robert Cade Into UF Hall of Fame thanks for sharing!! A salute to the ma for all that he has done in his career. He really deserves it, just see his career and his records to see why.